What do we mean by the word ‘artist’? Brainstorm as many definitions of this word as you can. One thing that all artists have in common is CREATIVITY and ORIGINALITY. Using a dictionary, find definitions of these words and write them down. You can add them to your notes above. Where possible, try to find more than one definition of each. With these definitions in mind, discuss with a partner the following statements. Make a note of whether you agree and disagree. Remember always to give your reasons. There is no such thing as originality. Even Shakespeare copied ideas for his plays from other stories. Creativity comes from inside a person. You’ve either got it or you haven’t. Being inspired by another person’s art and creating something using similar techniques is just copying. You don’t have to be original to be creative. There’s nothing creative about making music or images using a computer software package. Sampling a sound recording from another person’s music to use in your own piece isn’t original or creative. The ‘creative industries’ is a wide term that includes lots of different sorts of employment. In the chart below, the first column includes a list of jobs that you might find in the creative industries, such as theatre, film or computer games. Read through the job descriptions in the second column and try to match each description with the correct job title. Once you have matched up the job titles above with their descriptions, you will notice that some of these are jobs within the digital sector. This means the work they are involved in producing is presented or available online or in a digital format. Look again at this list and highlight those jobs that you think are most obviously part of the ‘digital sector’ of the creative industries. What other jobs can you think of that are also part of this sector? 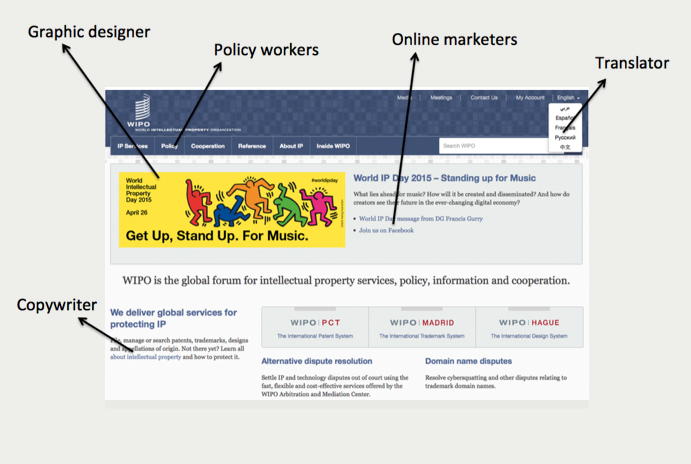 Browse some of your favourite websites and try to work out the roles of everyone who has worked on producing it and what their role might have been. Alternatively, look at advertisements in a magazine. How many creative jobs can you spot? If possible, print out some screen shots of a couple of web pages and try to label the different sections indicating who’s played a role in creating it. Here’s an example to get you started.